For 25 years we have successfully maintained our position as market leader among manufacturers of PVC and aluminium windows. 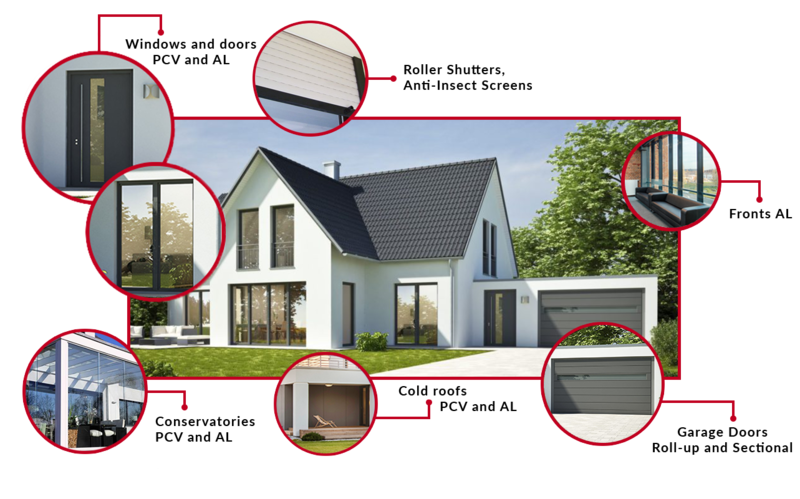 For our European clients we design, manufacture and install: PVC and aluminium windows, doors, conservatories, shop windows, glazing, glass walls. We serve both individual clients and institutions. We base our services on trusted, failure-free and unrivalled Kömmerling system profiles. We offer a class-leading and highly technologically sophisticated 7-chamber and 3-seal 88MD profile. We apply triple glazing with attractive and functionally innovative glass. We also construct: standard and structural fronts, fire-division, fire-protection, and smoke-proof joinery from a whole range of YAWAL sections. We manufacture all types of sunscreens and anti-insect screens, including: on-window roller shutters, built-in Venetian blinds, awnings built into boxes TYPE: OWAL, SK, INTEGRO, which at the customer’s request are integrated in various ways with the most up-to-date control systems of all kinds. Our standard service includes: security, warmth, soundproofing, style and products that are a joy to use. triple glazing, hasp lock, anti-burglary fittings, micro-ventilation and Secustic handles, turn-only casements, tilt-and-turn casements. 3-point double door bolt, B class lock insert with emergency function, hinge capacity of 120 kg, door panes with thickness of 58 mm. turn-only, tilt-and-turn, fixed or movable mullions, slide-only, tilt-and-slide; and for large-size products — automated sliding systems. The synergy of the high-tech components used in our products and their integrated cooperation with control systems makes the BEWI range extraordinarily innovative, smart, self-servicing, safe, energy-saving, soundproof, user and environmentally friendly and passive while ensuring the customer low operating costs, as well as an outstandingly elegant design. The quality control process that monitors key specifications in BEWI products is complemented by tests conducted at independent research institutes. Our products represent and set market trends, improve the competitiveness of real estate and passive technology houses developers. Create your very own Smart Home The solutions offered by BEWI allow you to move your home into the 21st century. Open a new chapter in your family’s life by choosing levels of convenience and security previously beyond our reach. Forget about the anxiety of leaving doors unlocked or the fear of unwanted guests when you are away. Find out more about the smart home with its modern security systems.